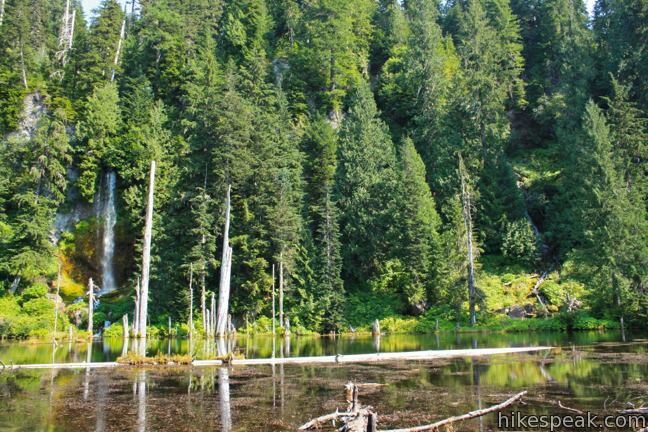 You know you’re hiking in a special place when the trail to a waterfall-filled lake in the shadow of America’s most famous volcano is not the area’s must-do hike. With so many exceptional trails in Washington’s Cascade Mountains, June Lake Trail could easily be overlooked. 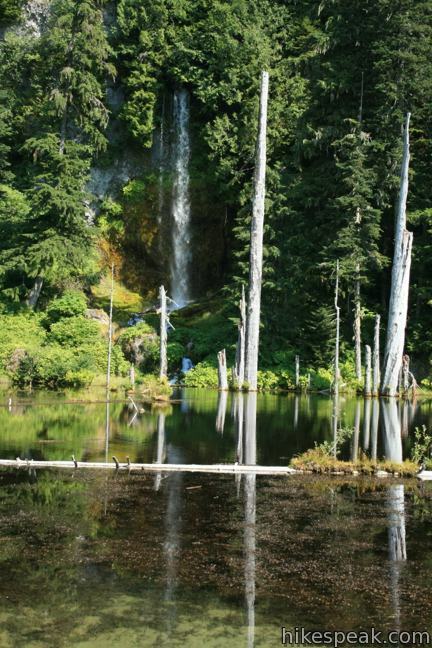 This 2.6-mile hike visits a shallow subalpine lake on the southern slopes of Mount Saint Helens. 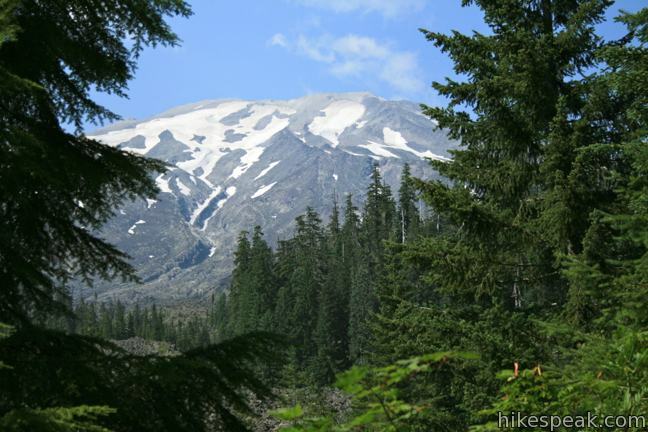 There is 450 feet of elevation gain en route to the lake along with glimpses of the great volcano. 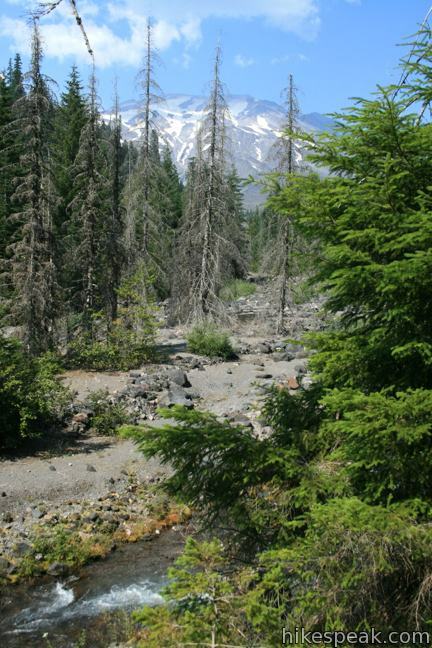 The wide trail takes a gradual course through a woodland on the border of a wash filled with lava rock boulders, evidence of Mount Saint Helens explosive past. 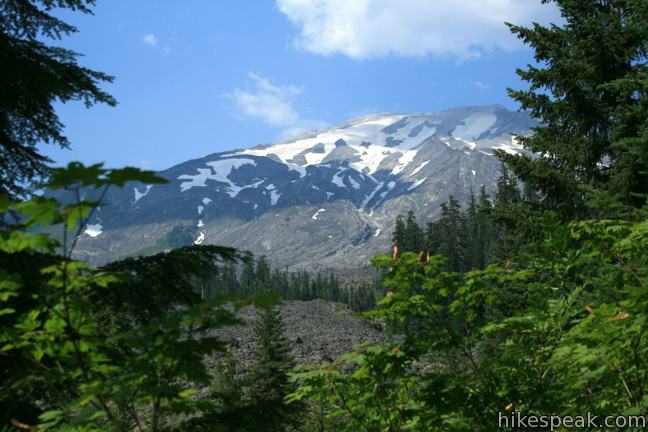 Hike in and out of shade enjoying peak-a-boo views of Mount Saint Helens. The best perspective of the volcano actually comes 0.15 miles from the start, inspiring expectations of grander vistas that never appear. After a mile, the narrowing trail turns downhill, crossing a short wooden bridge over the creek flowing from June Lake. 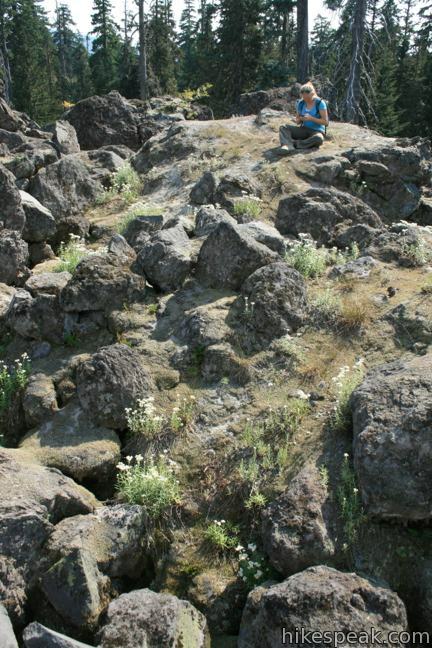 Ahead, you will break out of the forest on the edge of the small lake cradled below steep basalt cliffs. 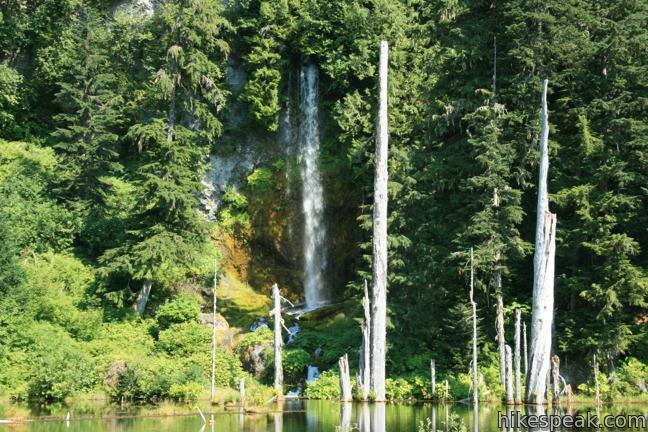 On the far side of the lake, a narrow waterfall plunges fifty feet out of the forest into the lake. Have a seat on a log and enjoy the serene location. Fire rings along the gravel shore suggest that this is a popular backpacking campground. 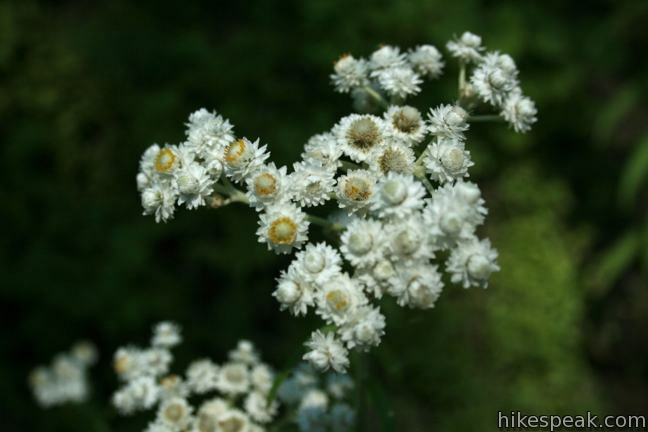 If you are inspired to continue up the trail for a closer view of Mount Saint Helens, know that it will not come easy. 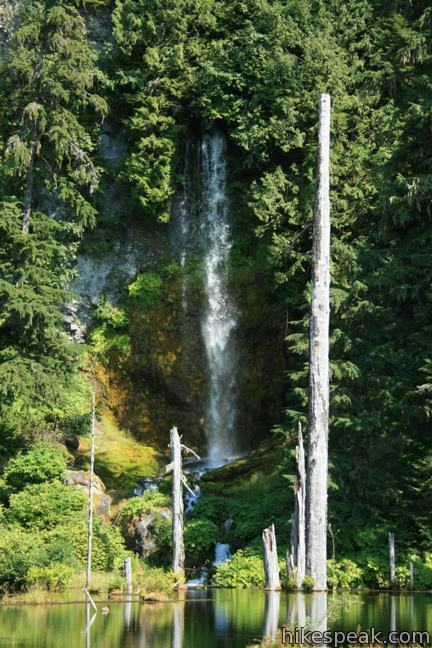 Your heart rate will rise dramatically as you ascend 275 feet over 0.3 miles through an old growth forest. Turn left at the T-junction with Loowit Trail and continue 0.15 miles to a field of basalt boulders. 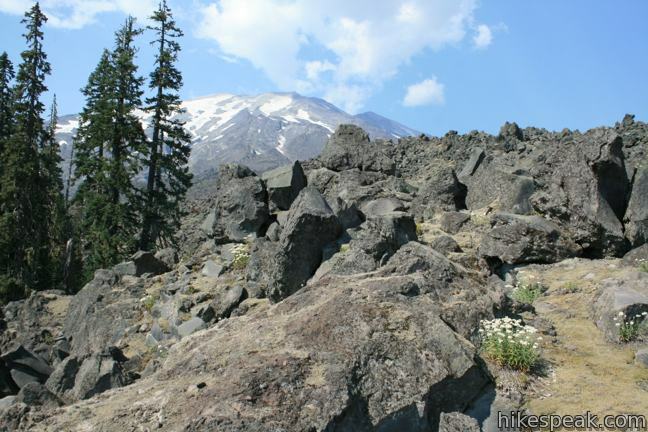 Scurry up the boulders or continue up the trail along the tree line for a view of the great volcano. Unfortunately, this perspective is not much better than the views along June Lake Trail, and you sure have to work for them. 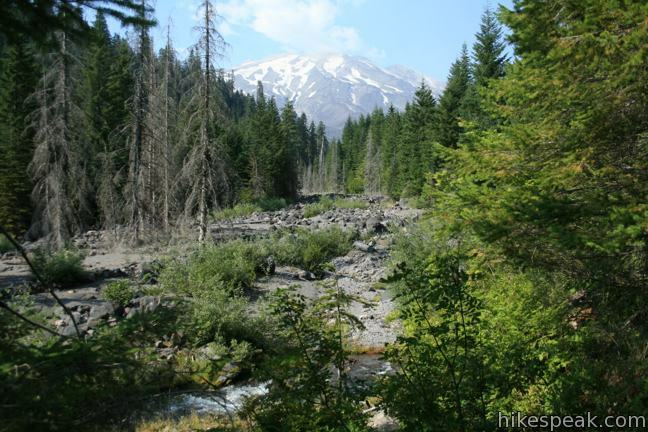 If you have limited time in the area, your efforts will be better spent on other nearby trails like Lava Canyon, Ape Cave Lave Tube, and Trail of Two Forests. June Lake is located in Mount Saint Helens National Volcanic Monument in Gifford Pinchot National Forest. A Northwest Forest Pass is required to park at the trailhead. You may self-register for the $5 day pass at the trailhead. An annual America the Beautiful national parks pass can also be used in lieu of the regional national forest pass. 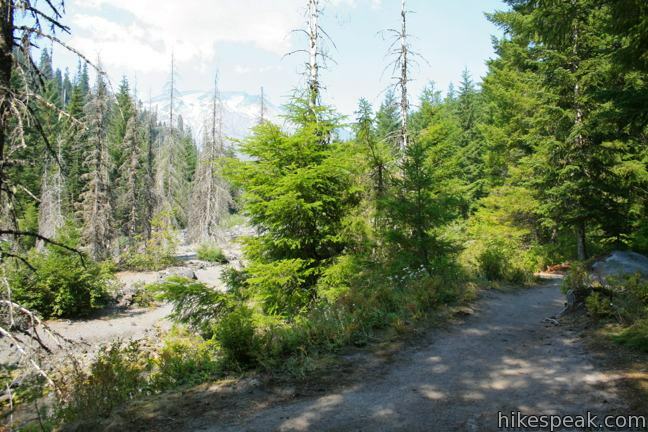 To get to the trailhead: From Interstate 5, 140 miles south of Seattle and 25 miles north of Portland, take exit 21 on to Route 503 East toward Cougar. After 35 miles, turn left on Forest Service Road 83 and drive six miles to the trailhead on the left. I’d like to backpack in here a camp a couple nights – any information on the rules, passes needed, etc? Can you park at the trailhead for a few days?